We try to introduce high quality authentic Japanese Chef knives & Whetstones. I born and raised a small town in Tokyo, Japan, and my father has owned a small factory that makes leather cases and bags over 50 years. My father factory had been my favorite play ground where is many craftsmen, variety of cutleries, tools, and machinery. I have been naturally love fish, so I majored in fisheries in College. I started worked the first restaurant, when I was 19 years old. After graduated the college, I started coming in Hawaii. I have worked more than 10 restaurants, and some construction works, and cabinet maker, etc. My working history has been very complicated to explain due to be a immigrant in USA, and I sometimes feel what I should work much less places deeper experiences, and I feel wasted my times to work so many places, but the other hand, those jobs that had made me to see lots of different things, and those things make me help to lead on solving difficult problems sometimes. I have worked mostly Japanese restaurants in Japan and Hawaii, and I had been sushi chef and Japanese soba (buckwheat) noodle chef. I cut my right index finger 4 or 5 years old at first time instead of cutting delicious apple (that apple was so tasty, so I could not wait for someone peeling it off), and I was stitched 2 or 3 stitches on the finger. The scar is still on my finger, and I remembered it was so soar to stitch at the doctor office. I bought my first high quality knife that was US made hunting knife about 10000yen at the time, when I was 14 years old. 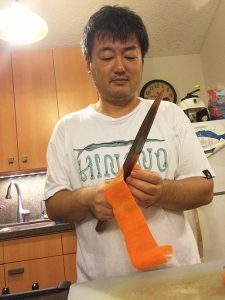 My first high quality cooking knife was Tsubaya 240mm Gyuto that was about 17000yen at the time, when I was 19 years old. It was over 30 years ago, so it was quite expensive cooking knife for armature cook, but it was very sharp edge on it, so it hooked me cooking knife world at first time. I had been vintage Colman lantern & fishing tackle business at first, and I started cooking knife business on 2006 little by little. Now, I am just running cooking knife, whetstone, razor, and other cutleries business.